The Seattle Progressive Forum presents "Why We Need Public Banking and How We'll Get It" on Wednesday, January 24, 7:30 - 9:00pm, at the Lake Forest Park Library, 17171 Bothell Way NE, Lake Forest Park 98155. The current private banking system in the U.S. is consumed with fraud, and most of the costs of this corrupt system falls on the backs of the taxpayer. 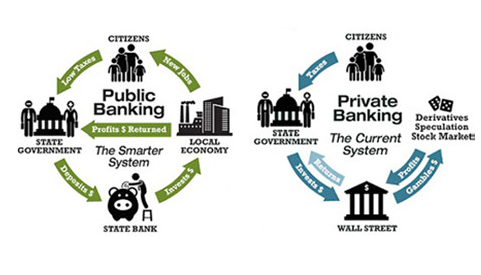 But there is an answer: Public Banks -- a system that funds community needs, and not Wall Street profits. Dennis Ortblad, member of the Seattle Public Banking Coalition will address the group and answer questions about the advantages of public banking over our current private banking system in Seattle and across the nation. For the last five years, Dennis has worked with local public banking advocates to seek legislation in both Olympia and Seattle to establish a public bank. Before his retirement as a diplomat in the State Department (US Foreign Service), he saw how well public banks can help countries overseas meet their needs. In assignments in Germany, Switzerland and Japan, he witnessed the work of public banks to fund infrastructure, education, and small business. Dennis concluded that a public bank here would be instrumental to help meet our communities’ pressing needs. In the Foreign Service, Dennis worked at embassies and consulates in Poland, Germany, Japan, Switzerland and the Philippines. He also served in the Executive Secretariat and in the Bureau of European Affairs in the State Department in Washington, D.C.
His work overseas involved advocacy to advance U.S. political and economic interests. Dennis' last overseas posting was as the economic counselor in Berlin until 2006. Dennis was born in Seattle and grew up in Seattle’s north end. After raising three children largely overseas, he and his wife returned to Seattle for retirement. Dennis graduated from the U of Washington with an M.A. in English. Isn't Maralyn Chase trying to get a Wa state bank for us?